It is important to understand that the daily rhythms are not just a response to changes in the light and dark produced by the earth’s spinning motion, but rather are a response to the timekeeping system within the body. It is this system which allows the organism to adjust and anticipate changes that are associated with day and night. Why is this so important? Consider the fact that if the urge to sleep would come during the light portion of the day, many animals would be vulnerable to predators. Anyone who has ever traveled extensively is familiar with the phenomena of jet lag, which is a profound disruption of the biological clock. The extreme importance of these phenomena has led to the development of a new science associated with the effects of time on the body. This new science is called chronobiology. At Circadia we focus on the effects of chronobiology and circadian rhythms on the skin. 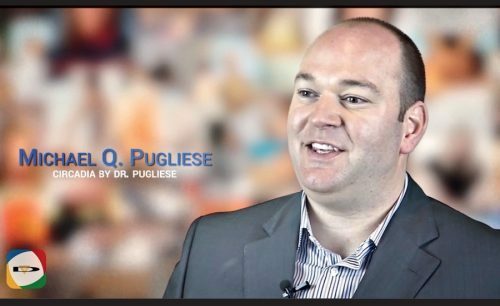 Come and meet CEO Michael Pugliese, educator, formulator and Skin Guru, his knowledge and passion to educate is infectious. Circadia By Dr Pugliese is changing the face of professional skincare treatments the world over.